We had been wanting to do a themed photoshoot for Ariel ever since she turned one. Since we did one for Angel previously, it wouldn't seem fair if the little sister did not get her very own photo album for keepsake. When we were brainstorming for ideas on the concept, the hubby said "Under the sea, of course!" Well, I was toying with princess and beach themes but the moment he said that, I knew we had made a decision instantly. 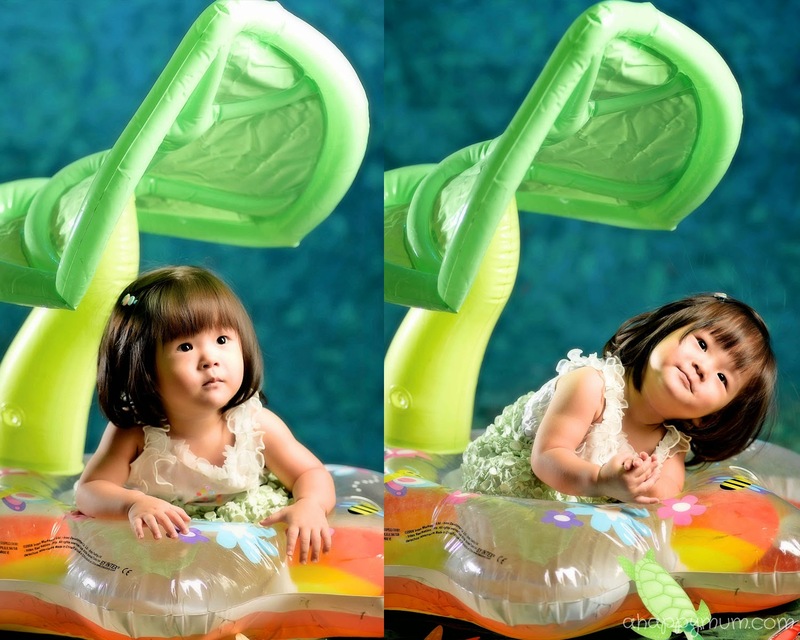 The photoshoot was done by Meng and Meivis of Imagegarden Commercial Photography who execute concept shoots for families and babies. 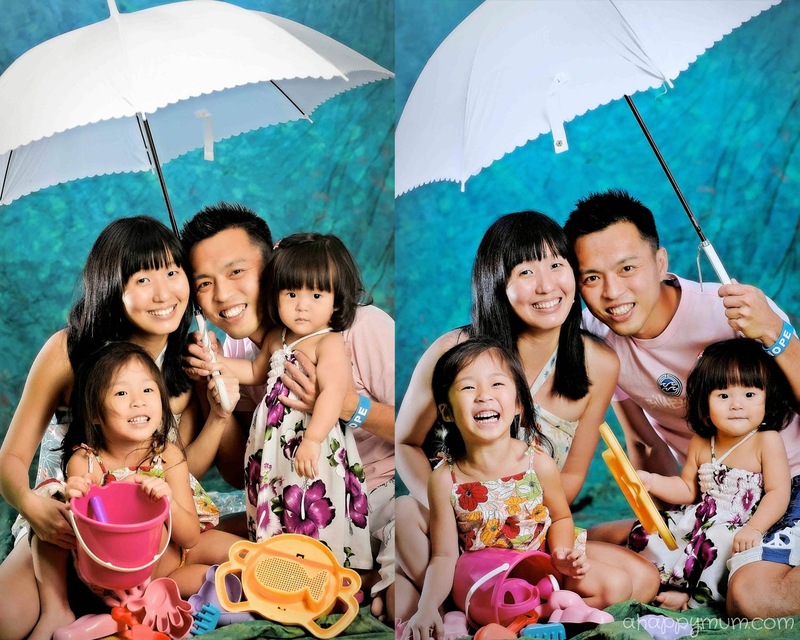 Unlike other more direct family shoots, they make sure they work with you to conceptualise and develop a theme that you like and translate that theme into beautiful end products. Wanna see how Ariel looked in the pictures? Here's sharing with you some of my personal favourites. Ta-dah! 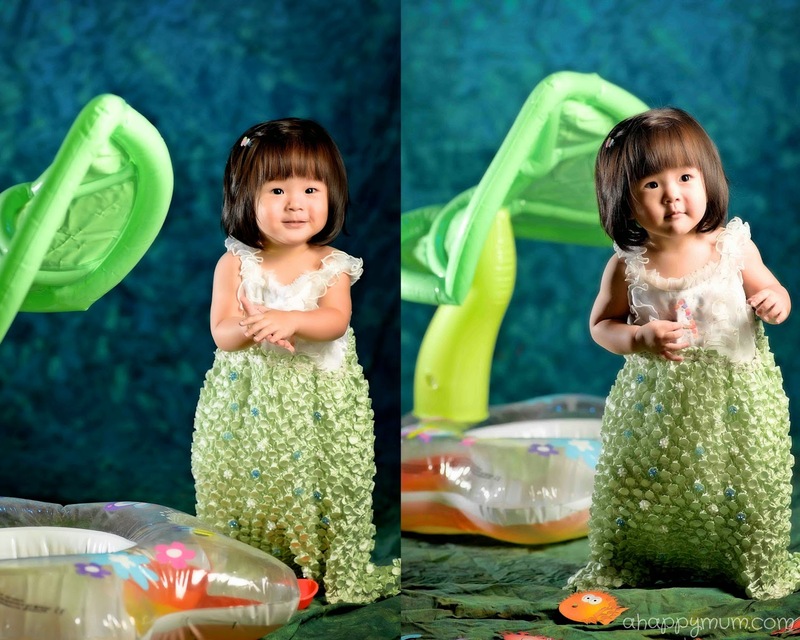 Of course, I was ecstatic to know that my DIY mermaid costume for her 1st birthday party could be reused for this shoot. So I spent the night before stitching back the parts which had come loose from her constant walking and tugging. Most of the props used in the shoot were ours since we already had these at home. However, I was very impressed by the effort Meng and Meivis put in for the turquoise backdrop which created an oceany and picturesque setting that was in line with our theme. For the second outfit, we dressed up our little star in beachwear and let her have fun riding the waves. The good thing about Ariel is that she is generally a happy toddler and smiles at the smallest things, so it wasn't impossible to capture some good shots of her. Wait, I said it wasn't impossible, but was it easy? Are you kidding me? Anyone who has done a photoshoot with babies or toddlers will tell you how tough and challenging it can be. To get that one good shot, you might need to take a few dozens. Other than those of her with her signature grin, I actually like those that caught her frowning, crying or whining. These are the moments that help to portray the real side of her, don't you think so? Meng has a flair for capturing these unique expressions at the right moments and I am just glad that I get to keep these precious shots for a lifetime. Ok, I said this was a Under The Sea or arguably a Beach theme photo shoot. But, which mum can resist dressing up her precious as a girly girl in beautiful dresses and pretty accessories? *ahem* I can't. Thanks to Meivis' spontaneity and skillfulness, she decided to take the curling tongs and gave Ariel a new hairdo within a short time. I think my girl totally rocked this hairstyle and somehow looked even more Japanese than she already is. Or so people tell me. This part of the shoot was the most challenging one as we had to come up with all sorts of methods to make Ariel stay put at the dressing table and not walk out of the set to look for me. When we realised that she was starting to get cranky, Meng and Meivis were very kind to give us short breaks every now and then for the little one to rest and recharge. These two pictures above were two of my favourites that day. I love the vintage looking furniture piece provided by Meng and Meivis and it was so exquisitely tiny that it fitted my girl perfectly. Or rather, it fitted both the girls. Obviously, it wouldn't be cool to leave the big sister out of all the action so we dressed her up in a fairy dress that we borrowed from our friend at The Gingerbread Mum. After Meivis gave Angel some curls. I thought for the first time, she looked like a mature, young lady in a photoshoot. Yikes, baby-ness no more! A pair of loving sisters, aren't they? You probably can't tell from these shots but we had to deal with an opinionated Angel who has her own way of doing things now that she is older and would choose to deviate from instructions. In fact, I even had to deal with tantrum after tantrum (that's the 24-hour role of a mum, right?) and Meivis was nice to offer little presents or sweets as rewards for the kids. What I appreciated most was the patience she and Meng provided in waiting for us to calm the kids down time and again just so we could capture that perfect shot. Lastly, we also took the opportunity to take some family pictures. I must say it seemed almost impossible at the start because without the husband and I to distract the kids, dance Gangnam Style, sing nursery rhymes, play peekaboo or just basically act like clowns in front of them, it was an onerous task trying to get both of them to look at the camera and give their best smiles. Many thanks go to Meivis, who did an awesome job of capturing the attention of the girls and to Meng, who did a most professional job and gave us these priceless memories of a happy family. 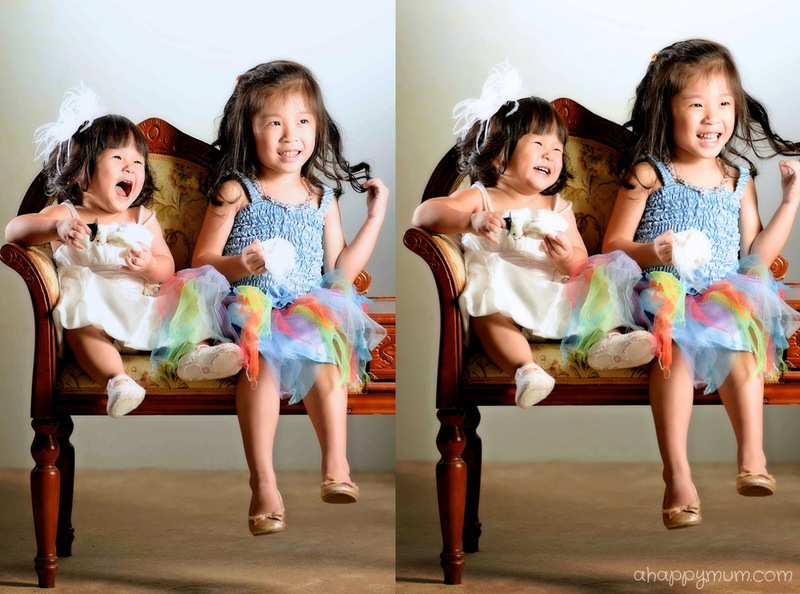 If you have not done photoshoots with your little ones, what are you waiting for? I am all for capturing these precious moments because once they grow up, you might just never get this chance again. 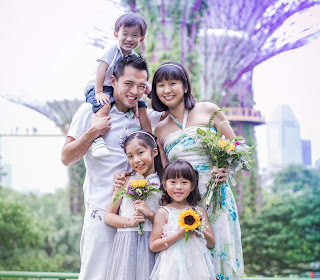 If you could choose a theme for your next family photoshoot, what would it be? 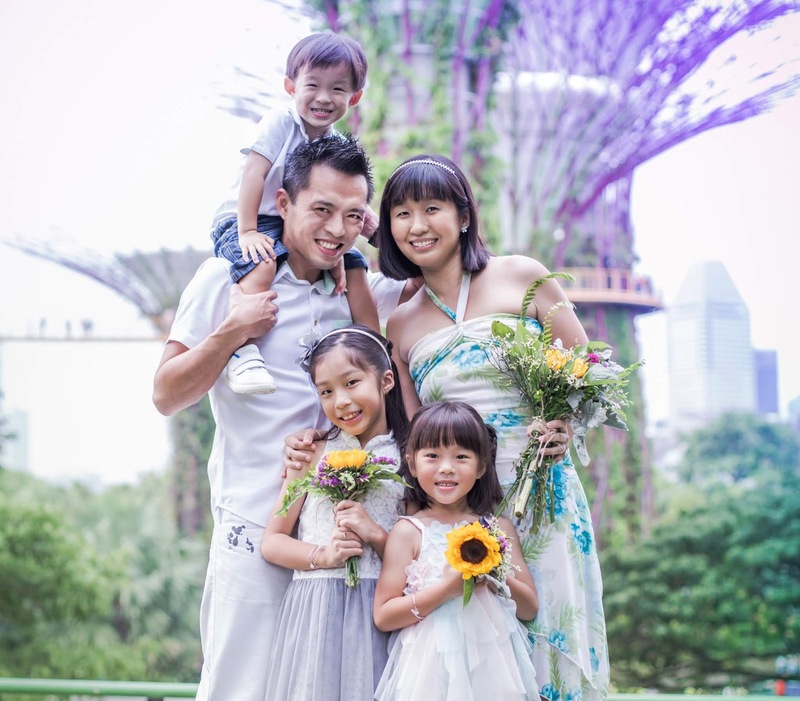 For all A Happy Mum readers, Imagegarden Photography is now giving a 10% discount on commercial packages for family shoots which range from S$800-$1600. All soft copies will be provided. Simply quote "AHappyMum" when you make your booking. Valid till 31 May 2014. Disclosure: This is a partially sponsored review. We paid a special discounted rate for the photoshoot and all the soft copies. All opinions are my own. Yeah I was glad I still kept it, it was coming off in some parts! Haha. Thanks much, girl, we both have sunshine daughters to cheer us up! I love Ariel's mermaid costume. You are so talented! And the shots are lovely. If I could choose a theme.. (teehee..) I'd love one on a hill dotted with flowers.